Manfrotto’s Mark II version of its 804RC2 three-way head is a small but welcome update to this highly regarded piece of kit. 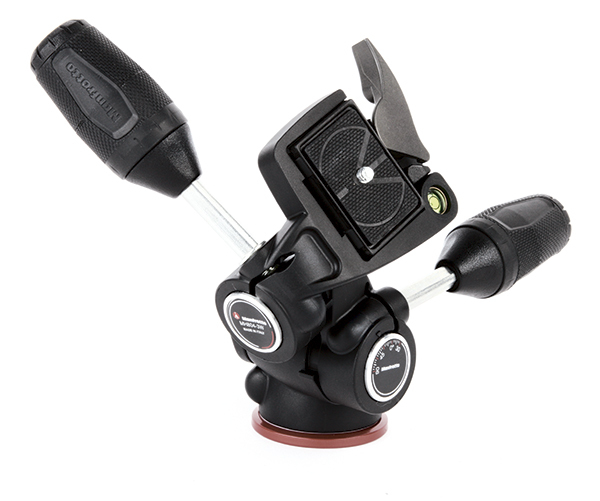 The only real change is to the control handles, with the two longer ones adopting the sliding collapsible design we previously saw on the more expensive XPRO three-way head, while the small pan lock is now shorter and stubbier. As a result, the new version is much easier to pack up for transport, without compromising its usability. Otherwise, it’s almost the same as its predecessor. At 750g it’s not overly heavy, being made from tough Adapto polymer, and it’s rated to support a 4kg load. The quick release uses Manfrotto’s standard RC2 pattern, and a bubble level helps with keeping the camera straight and level. I used an original 804RC2 in the studio for product shots, and found it to be a solid and reliable workhorse. It doesn’t have the load capacity or friction control of its XPRO bigger brother, and slightly jerky movements can make fine adjustment of the camera position difficult, but it’s good value for money and should last for years.